Product prices and availability are accurate as of 2019-04-23 02:08:51 UTC and are subject to change. Any price and availability information displayed on http://www.amazon.com/ at the time of purchase will apply to the purchase of this product. Stainless steel case with a brown leather strap. Fixed stainless steel bezel. Grey dial with rose gold hands and Arabic numeral and index hour markers. Date scale around the outer rim. Day of the week and month display above the center dial. Moonphase display above the 6 o'clock position. Automatic movement with a 42 hour power reserve. Scratch resistant sapphire crystal. Pull / push crown. Skeleton case back. Case diameter: 43 mm. Case thickness: 12.5 mm. Round case shape. Band width: 20 mm. Band length: 8 inches. Deployment clasp. Water resistant at 50 meters / 165 feet. Functions: date, day, hour, minute, second. Luxury watch style. Watch label: Swiss Made. 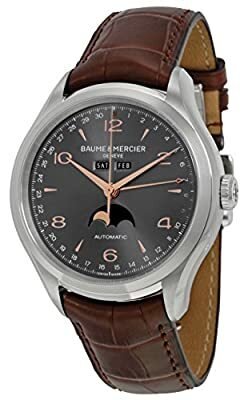 Baume et Mercier Clifton Grey Dial Brown Leather Mens Watch MOA10213.